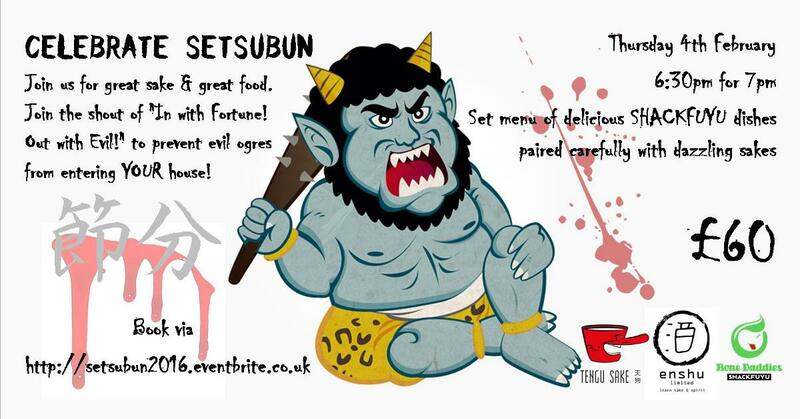 Setsubun 2016 – Sake & Food Extravaganza! CELEBRATE SETSUBUN 2016 – the demon banishing festival! Join us for great sake & great food. Join the shout of “In with Fortune! Out with Evil!” to prevent evil ogres from entering YOUR house! We’ve partnered up with the fantastic Japanese izakaya SHACKFUYU and sake eduction company Enshu to bring you a night to remember. Six delicious sakes carefully paired with nine Shackfuyu dishes! 6:30pm for a 7pm dinner. Event to finish around 9:30pm.